Is this Bronto built by Bronto Skylift? What is its full spec? Added by Bomba Boy on 18 May 2008. This was the demonstrator that was eventually bought by Cleveland and became A999 HAJ. Added by Ian Moore on 18 May 2008. I'm just wondering; did London have any of these Shelvoke HP's? Or were they just used by brigades outside of London? Added by James Marks on 04 July 2008. James, London Fire Brigade had 10 S&D/CFE - Simon Snorkel SS220, numbered HP3P to HP12. 7 were from 1980 and the other 3 from 1981. Added by Fire995 on 05 July 2008. Added by Pete Gardner on 10 February 2009. This - the demonstrator - was one of only two Brontos that were true HPs (rather than ALPs). The other HP was Leicestershire's D874 YFP. Added by Ian Moore on 11 February 2009.
platform was based at the beautiful old Central Station in Lancaster Road. was taken aback to see every bay with an appliance of some type in it. I photographed the 2 pumps, ET, CIU, the HP and the Carmichael/Iveco TL. 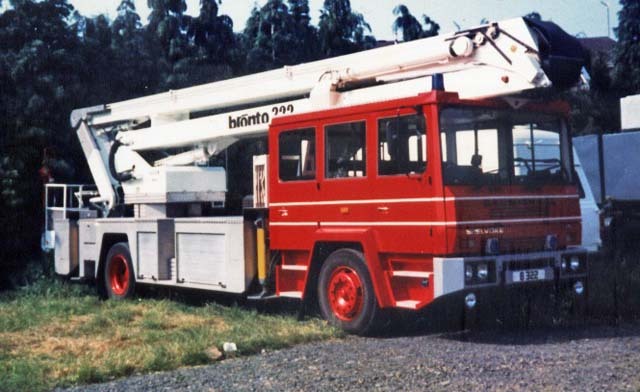 The Shelvoke/Bronto hydraulic platform had a 3 man type cab configaration. couple of pumps, a Landrover and also a Dodge Foam/Salvage Unit. Added by Pete Matten on 11 February 2009. Any chance of those pics being uploaded on here? Added by Pete Gardner on 11 February 2009. Pete, yes thats no problem and I'll send some of them in soon. pictures I've been asked for.I will sort them out though. Added by Pete Matten on 12 February 2009.